New York Crain, Feature Story "100 Most Influential Women"
Months after she took over the New York Immigration Coalition two years ago, Chung-Wha Hong organized the largest immigration rally in New York City history, attracting more than 300,000 people for a march on City Hall. Around the same time, the 41-year-old native of South Korea helped win an influx of $700 million in state funds for local schools to help immigrant students who don't speak English. And this past summer, after intense lobbying from a coalition put together by Ms. Hong, Mayor Michael Bloomberg enacted a law dramatically changing housing-code enforcement and mandating quick action by landlords to ensure that all violations are promptly addressed, a move that will help immigrant- and low-income families living in homes without hot water or heat. Those are just a few of Ms. Hong's victories in a 20-year career fighting for the rights of immigrants. "I've never seen anyone in my life show such a strong commitment and dedication for social justice," says S.J. Jung, president of the Young Korean American Service and Education Center. "She is the hardest-working person on earth." Stories of Ms. Hong's tenacity are legendary. About 10 years ago, when she was executive director of the National Korean American Service and Education Consortium, Ms. Hong worked around the clock for days until she finally collapsed and was rushed to the hospital. As she was falling to the floor, she grabbed a stack of mailings, handed them to a staffer and said, "These must go out today." 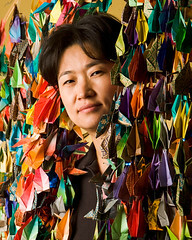 Ms. Hong, who arrived in St. Louis at age 11 with her family, is following the work ethic she saw her parents exhibit. Her father and mother worked multiple jobs as they built lives in the United States. Ms. Hong came to the country without knowing English and spent her afternoons with a tutor. The family later moved to Boston, where they lived in housing projects, and Ms. Hong went on to graduate from the University of Pennsylvania. Now that Ms. Hong, who lives in Flushing, Queens, with her three children, is established here, she feels it is her responsibility to help newcomers. The coalition is made up of 215 immigrant organizations. When Ms. Hong meets with government officials, she always brings representatives of these groups. After years of lobbying for immigration reform, she is still smarting over the recent demise of federal legislation. But she is plotting the next battle. "There were people who thought that finally they would be able to come out of the shadows and live as Americans with equal rights, and that was pretty devastating," she says. "That's why we're going to pull together a multisector coalition and create new momentum."